Christie's was propelled to its biggest auction ever by selling $745 million worth of art, fueled by Barnett Newman and Francis Bacon paintings and billionaires from around the world who competed for the masterpieces. The tally on Tuesday in New York surpassed the auction house's results in November of $691.6 million and last May's total of $495 million for postwar and contemporary artworks. The two top lots -- Newman's Black Fire I and Bacon's Three Studies for a Portrait of John Edwards -- accounted for $165 million of last night's total. Of the 72 lots offered, 94 per cent sold and only four works failed to find buyers, Christie's said. Four lots sold for more than $50 million and 63 lots fetched more than $1 million. Records for 10 artists were established, including for Newman, Alexander Calder and Joseph Cornell. Five of the top 10 pieces in the sale were bought by Xin Li, Christie's deputy chairman in Asia, who bid on behalf of clients on the telephone. "I don't know what money means anymore," said Asher Edelman, an art dealer and founder of ArtAssure, an art financing company, as he exited the Rockefeller Center salesroom halfway through the auction. Sitting in the front of the packed room of more than 800 people were fashion designer Marc Jacobs and James Tomlison Hill, vice chairman of Blackstone Group LP. 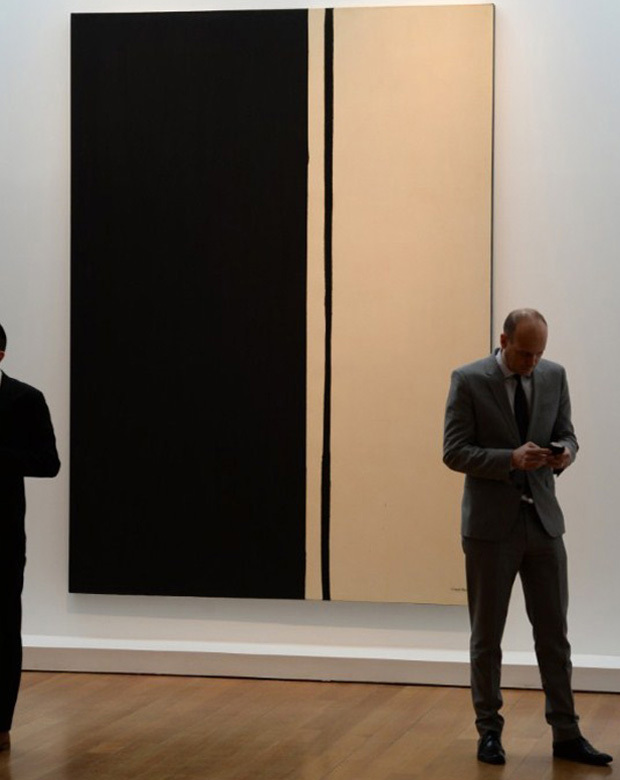 The top lot, Newman's 1961 abstract canvas that until recently was on view at the Philadelphia Museum of Art, fetched $84.14 million, almost doubling the artist's previous auction record of $43.8 million set just a year ago. Bacon's triptych depicting his longtime companion in twisted poses, sold for $80.8 million. Mark Rothko's 8 1/2-foot-tall 1952 canvas layered with purple and orange hues sold for $66.2 million against an estimated range of $40 million to $60 million. Bacon's triptych's sale was within the estimated range of $75 million to $95 million. The 1984 work, showing the artist's confidant sitting on a stool with his leg crossed over his knee against a pale green background, fell short of the $142.4 million achieved for Bacon's Three Studies of Lucian Freud in November. Bacon's Freud triptych holds the record for the most expensive artwork sold at auction. Prices for top-tier postwar and contemporary artworks are on the rise as collectors view them as investments and status symbols. Christie's, Sotheby's and Phillips this week expect to sell as much as $1.5 billion of art. The sales are part of the semi-annual auctions in New York, considered important barometers of the art market's health. Prices include commissions; estimates don't. Global annual sales of postwar and contemporary art increased by 11 per cent in 2013, with a highest-ever auction tally of 4.9 billion euros ($6.7 billion), according to a report published in March by the European Fine Art Foundation. New York confirmed its position as the centre for the biggest auction and gallery transactions, according to Clare McAndrew, a cultural economist who compiled the report. Consignors of 40 lots in Tuesday's auction were guaranteed an undisclosed minimum price regardless of whether the work sells and in many instances Christie's found a third-party to finance the guarantee. Christie's on May 12 sold $134.6 million of contemporary art in New York in an hour in an auction titled If I Live I'll See You Tuesday taken from a Richard Prince work. International buyers from 26 countries chased after works that helped Christie's surpass its high target of $124.1 million for the sale. A Martin Kippenberger painting from 1988 of a slouching man in his underwear was the top lot sold, fetching $18.6 million. The painting had a high estimate of $12 million. Coupled with Tuesday's auction, the two events raised $879.5 million. The auction started with a group 14 lots from the estate of Edwin and Lindy Bergman, Chicago-based collectors and art patrons known for their holdings of Surrealist art and Joseph Cornell. It included seven Cornell works, Calder's 1957 mobile and Pablo Picasso's portrait of his lover Dora Maar. Calder's 7 1/2-foot-long mobile Poisson volant (Flying Fish) fetched $25.9 million, setting an auction record for the American sculptor. Estimated at $9 million to $12 million, it was toured in Hong Kong to appeal to Chinese collectors. The Bergmans bought the mobile, which depicts the silhouette of a fish with wire whiskers, in 1965. While they were its sole owners for almost 50 years, the work has been in at least a dozen museum shows, including those in Switzerland, Finland, Holland and France. Picasso's Dora Maar went for $9 million, surpassing the high estimate of $6 million. Cornell's Untitled (Penny Arcade Portrait of Lauren Bacall), fetched $5.3 million, setting an auction record for the self-taught American artist. The 1946 jewel-like box, with images of Bacall on blue background, was inspired by To Have and Have Not, a film starring Bacall and Humphrey Bogart. A couple of minutes later the artist's record was smashed by another Cornell box, Medici Slot Machine, that sold for $7.8 million, more than twice the high presale estimate of $3.5 million. The bids came so fast, "I could barely get my hand up," said Todd Levin, director of Levin Art Group in New York, who was sitting in the front row. "We are dealing with people who have $20-$30-$40 million in expendable income for, basically, luxury goods." Warhol's silkscreen painting depicting the 1963 race riot in Birmingham, Alabama, sold for $62.8 million to gallery owner Larry Gagosian. It was valued at about $50 million. The almost square canvas, showing the same image four times (on white, blue and red backgrounds), had once belonged to artist Robert Mapplethorpe. It last appeared at auction in 1992, selling for $627,000. Warhol's acrylic and silkscreen ink on linen portrait of actress Marilyn Monroe sold for $41 million. The high estimate was $18 million. It was bought by Laura Paulson, Christie's chairman and international director of postwar and contemporary art. Gerhard Richter's 1990 abstract painting Abstraktes Bild (712) fetched $29.3 million, 68 per cent above its last auction in November 2012 when it sold for $17.4 million. Christie's Li outbid the competition to get the work for her client. "Asia is a huge new force," London-based jeweller Laurence Graff said at the auction. "We see it in our business as well. But diamonds haven't done as well as art. Did you see that Richter? It gained more than 50 per cent in a year and a half."